African spurred tortoises are the third largest tortoise in the world. In addition to being able to survive in extreme temperatures and dry conditions, spurred tortoises can live 50 years in the wild and over 80 years in captivity. The prehistoric looking alligator snapping turtle is a pro when it comes to surviving in the aquatic world. With an expertly camouflaged shell and a built in lure for prey, they are fascinating and successful predators. Arizona mountain kingsnakes, or Sonoran desert kingsnakes are black, white and red. This snake uses these colors to mimic the deadly coral snake. Ball pythons are also called the Royal Python. Legend has it that Cleopatra wore a young ball python around her wrist thus leading to the species name “regius”. In the wild Boas will feed off small mammals like rodents and small monkeys. They will also eat birds and their eggs and even other small reptiles. Boas constrict their prey until it suffocates. Like most Boas, these snakes are mainly arboreal, which means they spend most of their time in the tree tops. This is a good place to capture prey and stay safe from much larger predators. The bull snake's best defense is all an act. By pretending to be a rattlesnake, it can fool most predators. A bull snake will flatten its head, coil up, and even "rattle" by pushing air through its mouth. One of the biggest species of snake in the world, adult Burmese pythons can reach 25 feet and weigh more than 200 pounds. When Chuckwallas feel threatened, they will scurry under rocks and gulp in large amounts of air, inflating their body, which makes it difficult for a predator to extract it from a crevice. Crested geckos were thought to be extinct until they were rediscovered by scientists in the early 1990s. They are listed as vulnerable due to habitat loss. The desert tortoise is the largest tortoise in North America. They are masters when it comes to living in a hot, dry climate and will stay protected in burrows that can be anywhere from 3 to 30 feet long. It doesn't have legs, but it's not a snake! The glass lizard is the largest lizard in its family with an average length of 2-3 feet. 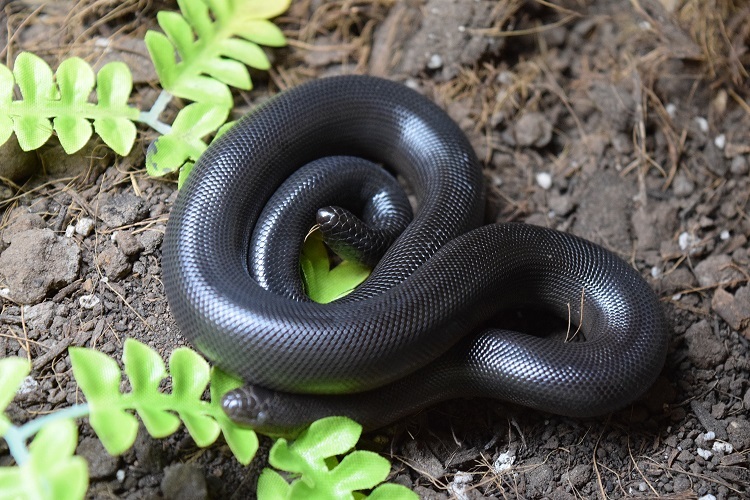 Formerly considered its own subspecies, many experts believe that the Everglades rat snake is simply a color variation of the Eastern rat snake. Geckos are the only lizards that can produce more than a hiss or other simple sounds. Their vocalizations range from squeaks and clicks to barks and croaks. At 6.5 feet in length, green iguanas are among the largest lizards in the Americas. Their tails, which make up almost half of their length, can be used to deter predators and will detach if they are caught. Green tree pythons are non-venomous, however they have extremely long fangs which help them catch birds, their preferred prey. Newly hatched green tree pythons are yellow and turn more green with each subsequent shed. Like its close relative, the ornate box turtle, the gulf coast box turtle has a special adaptation to protect itself from predators. Once its head and legs are pulled into the shell, it's difficult for even a very determined predator to pry it open. According to local folklore, Honduran milksnakes would sneak into barns to drink milk from the cows. Snakes don't drink milk; they prefer to eat mice, which are readily available in barns and other areas where livestock are kept. 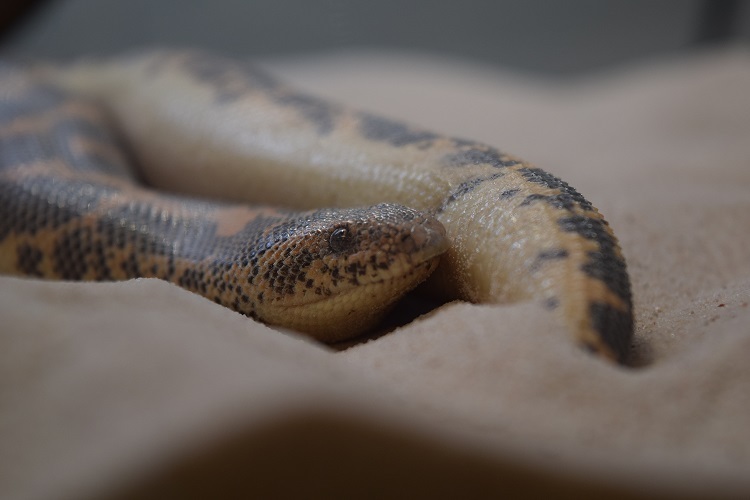 The Kenyan sand boa spends the majority of its life beneath the surface of the earth, laying in wait for unsuspecting prey. 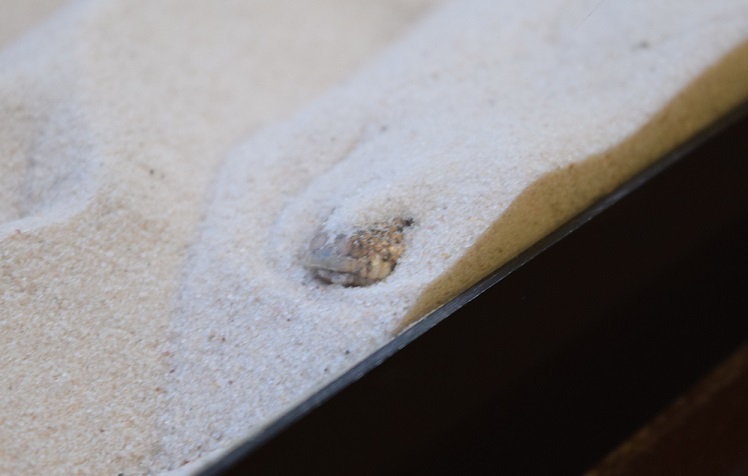 When something suitable wanders past the sand boa strikes and quickly constricts, using its stocky body to suffocate its prey. 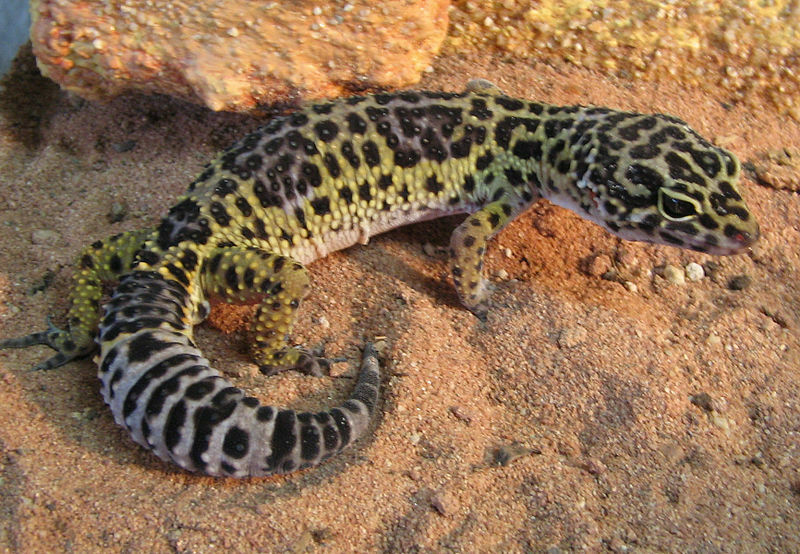 Like many geckos, the Leopard Gecko can break its tail off at the base when threatened or disturbed. This process is known as caudal autonomy. The tail will regenerate, but will be smaller and less colorful than the original. The leopard tortoise gets its name from the unique patterns on its carapace that resemble leopard spots. They are one of the largest mainland tortoises and their shells can reach up to 2 feet in diameter. Box turtles are exclusive to North America. They closely resemble tortoises and spend their time on land, rather than in water. Pancake tortoises are shy and fast moving. When threatened they quickly scurry into rock crevices where their soft shell makes it easy to wedge their body in tight, making it difficult for a predator to extract them. Imitation is the name of the game with the hog-nosed snake. When threatened it will flip onto its back and emit a foul smelling musk, tricking a potential predator into thinking it is dead. The red footed tortoise ranges through much of the Amazon basin and can be found in a wide variety of habitats. Red footed tortoises can be spotted in dry savannas, grasslands, and stretches of rainforest where these habitats mix. The rosy boa is one of two species of boa that are native to the United States. Rosy boas are ovoviviparous, which means that the young grow inside the mother in soft eggs. They hatch inside and are born live rather than incubating outside of her body. 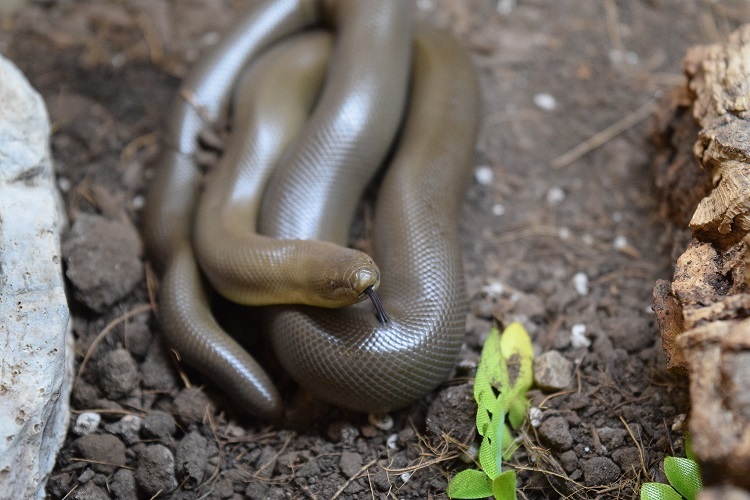 The blunt appearance of a rubber boa's head and tail is one of its best defense mechanisms. When threatened, the boa will coil up and use its tail as a decoy, moving it side to side and even striking with it. This Australia native is true to its name and uses its spiny, spiky tail to protect the softer portions of its body when wedged into a crevice. The uromastyx is a shy lizard that quickly heads for cover at the first sign of danger. In their native North African range, they spend the day basking on warm rocks. The wood turtle's name comes from the sculpted appearance of the carapace, or top part of the shell. The shell serves as protection and camouflage. Yellow anacondas are named for the yellow color on their bodies. This color with the dark splotches helps them to camouflage well in wooded areas and water. Rat snakes are arboreal, meaning tree dwelling. They live in forested areas with plenty of brush and trees. They will frequently prey upon birds and bird eggs.